Have you ever wondered how to find help or a community service for yourself or someone in need? The 2-1-1 call center provides information on and access to over 140 Dare County-based services. There are also links to more than 400 regional, state and national programs, with the 2-1-1 database continuously checked and updated for accuracy. The call to 2-1-1 is free, confidential and available in any language 24 hours a day, seven days a week, 365 days a year. 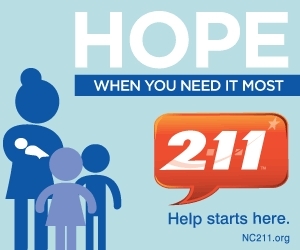 And all the information at the 2-1-1 call center can be accessed online as well at nc211.org. Bringing together a wide range of outreach, charitable and helping groups and organizations from throughout the area, the Outer Banks Community Services Collaborative spearheaded the effort to establish NC 2-1-1 in Dare, a comprehensive resource databank of human services, a help-line system, and a volunteer information component for the county for those seeking assistance and for those providing or interested in providing assistance. The NC 2-1-1 program was launched in 2012 with funds from the Outer Banks Community Foundation and the Outer Banks Relief Foundation. Dare 2-1-1, led by Patty McKenna, Relief Foundation Board Member — is now funded by the Outer Banks Relief Foundation with support from TowneBank. We are committed to working together with all of our helping and outreach agencies and groups in our community, to minimize duplication of effort, and to maximize our limited resources by working together for the benefit of all our citizens and our Dare County community. It’s an easy-to-remember number that connects callers with help when they need it. Like 9-1-1, it’s always available. 2-1-1 has comprehensive information about nearly every available health and human service that exists in our region. 2-1-1 maintains a comprehensive database of community services and volunteer opportunities. 2-1-1 is answered 24 hours a day, 7 days a week. 2-1-1 speaks your language. Call specialists use a translation service to assist callers in over 400 languages. Call specialists must pass a comprehensive test of their knowledge in order to be certified by their national professional organization. Having trouble making ends meet this month? Need to find an affordable child care center? Looking for summer programs in your neighborhood? Wondering whether you are eligible for food stamps? Ready to escape an abusive relationship? Looking for the perfect way to volunteer in your community? Dial 2-1-1 and Get Info. Help Starts Here.